by Diane - April 24th, 2012. The hotbin is a hot composter that can deal with cooked food waste. This means you’ll be able to compost even more at home. The hotbin is quite a neat size too – it’s not massive like the normal garden composters. This is great if you don’t have a big garden space. What’s the hotbin then? It’s a 200 Litre hot aerobic composting bin that can compost all food waste including meat and fish. It’s been designed to ensure that you don’t have to worry about smells, flies or rats! Regularly adding waste allows the bin to keep building up to 60’C which is what is needed for safely composting food waste. You can also add garden waste to this bin too. You need to add a bulking material when you add food waste to the bin. This is to ensure the process takes place correctly allowing air to flow around the food waste. If the waste just sits in a big mass then this is when it goes slimey and horrid. You can use bark chippings and you can shred paper or cardboard to add to the bin too. It sounds quite scientific but it’s very simple. Add food waste and other materials to ensure the right mix. The compost takes 90 days to be made. The system doesn’t require any turning – just a light touch with the rake to mix in new material when you add it. This is easier than traditional compost bins where you either have to leave the pile for months and months, or turn it out and replace it into the bin. 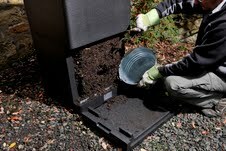 The hotbin looks like the easy option for making compost at home. Whilst my own council recycles food waste, not all councils do. I’d still prefer to recycle my food waste at home. My local authority sends it off to be composted and then the material it makes is sold back to council tax payers! The hotbin would allow me to keep all my food waste and recycle it properly and safely. If your council doesn’t collect food waste separately then the hotbin would mean your general waste bin would start to smell better as you stop putting food in the refuse bin and put it in the hotbin instead! Of course we should all aim to reduce the amount of food we throw away by learning to use and store leftovers properly. Even if you do this really well you’ll always have leftovers you can’t actually eat, or plate scrapings that you can’t do anything else with. All these bits could be composted at home in your hotbin! The hotbin sounds like another useful tool for anyone interested in reducing what they throw away.